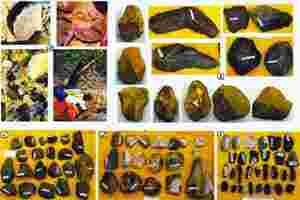 Ancient links: Clockwise (a) The implements in different rock strata; (b) tools from the Lower and Middle Palaeolithic period; Mesolithic implements (e) and Middle Palaeolithic tools (c and d). New Delhi: Archeology could give the poverty- and strife-torn districts of Bastar and Dantewada in Chhattisgarh an image makeover. A team of scientists largely from the Anthropological Survey of India has unearthed a trove of Stone Age tools from caves in these districts that offer evidence of human habitation in the region some 50,000 years ago. The tools, described in a paper in the latest issue of the Current Science journal, are an assortment of axes, cleavers, picks and choppers similar to implements found in other parts of Asia and Europe during the so-called Palaeolithic period (spanning nearly 2.5 million to 10,000 years before today). These were discovered by expedition teams that included anthropologists and archaeologists from the Indira Gandhi National Tribal University in Amarkantak, Madhya Pradesh, and the Pandit Ravishankar Shukla University, Raipur in Chhattisgarh. The expedition, between December 2008 and January 2009, identified 13 sites with these implements. While there is little disagreement that the caves in Madhya Pradesh, Chhattisgarh and parts of Maharashtra are home to the earliest tribes in India, who were largely hunter-gatherers, most of the primitive artefacts found are not older than 10,000-15,000 years. The implements found in the Chhattisgarh caves, which potentially date back to over 50,000 years, could upgrade the archeological as well as the historical significance of these districts, which are characterized by crippling backwardness, according to experts. “Given the political situation at this point, it is a stretch but if these regions could gain cultural and historical importance such as the Afar region in Ethiopia and other similar sites in South Africa, there could be more international awareness, funds and possible development in that region," said Narendra Sahoo, an anthropologist at the University of Delhi. The Afar region in Ethiopia and several sites around South Africa have over the last 70 years revealed human and pre-human fossils, the oldest of which are 3 million years old. These have contributed significantly to archaeologists’ understanding of the pace and spread of the evolution of humans from primates. None of the scientists involved in the study was immediately reachable for comment. In their paper the researchers say, “...the Bastar region needs thorough palaeoanthropological and archaeological explorations and excavations. A detailed exploration couldn’t be done because of social unrest." They added that the prehistoric man, including Homo erectus and ‘archaic’ homo sapiens (our species) penetrated into the Bastar region as a result of a gradual southeastward expansion from the Narmada valley. In spite of a rich tradition of palaeoanthropology, excavations for pre-human fossils and implements have yielded precious little, partly because of limited manpower and because regions of India that hold promise as troves for fossils—swathes of Central and North-East India—aren’t accessible to archeologists because of political and social tensions. “This has been among the prime impediments to finding exciting human fossils, though there is little doubt that several finds wait to be unearthed in India," Ashok Sahni, a palaeobotanist, said in an earlier interview.